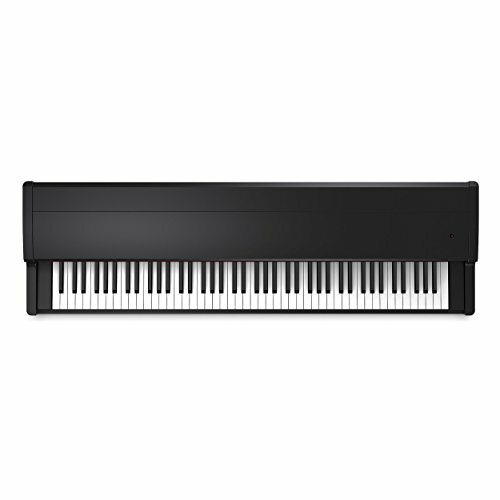 88 key midi controllers offer the melodic range and playability of a full-sized piano keyboard. Although many music producers opt for smaller keyboards, full-size controllers are essential for those who want up to seven octaves beneath their fingertips. Some feel like real pianos, with velocity-sensitive weighted keys, sustain pedals and soft pedals. Others lack these features, but still offer a piano’s range often with additional features such as pitch shifters and modulation wheels. We review both these types here. Ok, let’s get started. Here’s what we cover in this article. For maximum effect, I encourage you to read the whole thing to make sure you buy the right purchase. What is an 88 Key Midi Controller? 88 key midi controllers are used to control your DAW (digital audio workstation) software for recording music. They can be set up to a variety of virtual instrument sounds, but controllers of this size are often used by pianists to simulate grand pianos when they need something lightweight. One of the major benefits of them is creativity. Being full-size, they let you reach the seven octaves you’d find on a standard piano, but many also feature ‘octave’ features which let you go even lower or higher than a piano. Access to so many notes allows you to play parts that are impossible on a smaller keyboard. Thanks to their midi connectivity, these machines are designed for connecting to a DAW which makes them incredibly useful tools in the studio. Some have additional midi drum pads so you can also use them to make beats too. Lower end products often aren’t weighted at all. On low to mid-range products you’ll find semi-weighted keys which are controlled by springs and have a slight piano feel. They do allow you to put some expression into your playing. Second up, you have hammer-action keys which are weighted via a small hammer which is attached by a lever system to the key, somewhat replicating a piano’s system. These are often found on mid to high-end products. Finally, graded hammer-action keys are the best kind, and play like a piano. It’s a must for those who want to emulate a piano on stage or in a recording. Some of these products have what are called ‘zones’. These are sections of notes which are assigned to a particular sound. If you want different settings assigned to different note ranges, it can be really useful. Maybe you want your high notes to have an added reverb, but not your lower end notes? Zones will allow you to achieve this. The pitch wheel is used to bend the pitch of your notes and leads to some cool sounds. The modulation wheel is most commonly used to add vibrato to the note that’s being played. Like the pitch wheel, it’s incredibly flexible and can lead to some cool, fun sounds. Usually, they’re powered via USB into our laptops or PCs. 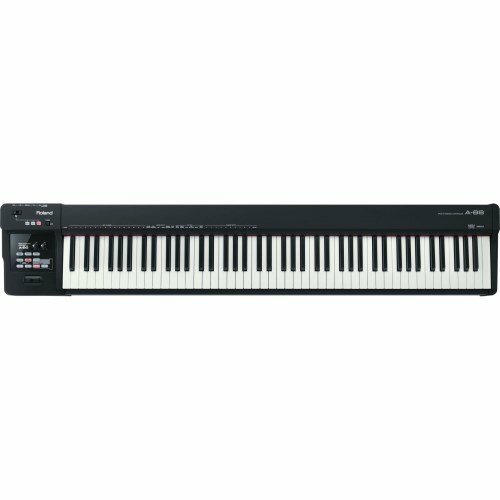 However, as well as a USB connector, some of these keyboards also have midi ins and outs which let you attach additional midi instruments or devices. Connectors for foot pedals are also something to look out for if you are likely to use sustain or softener pedals – some keyboards also have assignable foot pedal connections. If you want to power your controller via your laptop, make sure that it’s bus-powered. Some of these products require an additional mains socket, as an AC or DC adapter power them. Of course, it’s not a problem for some people, but a bus-powered instrument can come in handy when you’re not sure about the mains supply situation. Aftertouch allows midi data to be sent after a key is pressed. It can control vibrato, volume or whatever else you set it to, and can give you an extra level of control in your keyboard playing. This is a feature that’s most commonly found on the higher end units. So, now you know what to look out for, let’s have a look at some of the best ones on the market. To make things easier for you, we’ve included some information about what kind of player each of these products is best suited to. This is a budget-friendly, lightweight product. It has pitch and modulator wheels to enable powerful performances, as well as an octave key to give you more control over your range. It comes with velocity-sensitive keys, though not weighted, and there are connectors for both sustain and expression pedals. It also has its own volume control and record, play and stop buttons and can be powered by either USB or via an adaptor, so you can choose which suits you best. It will be suited to musicians on a budget and want a keyboard to make melodies or play chords on. As there are no pads on this controller, it will be less suited to those who want to make beats. Pitch shift, modulation and octave controls which enable expressive performance. Four zones, so you have the creative options of 4 channels in one instrument. Only semi-weighted keys, so it won’t feel like a piano. Ableton software is ‘lite’ version, so you’ll probably need to upgrade to the full version at some point. The Alesis Q88 has semi-weighted, velocity-sensitive keys and modulation and pitch wheels. There are connectors for sustain and volume pedals, and it can be powered by USB. It’s compatible with pretty much all DAW software, and it comes with Ableton Live Lite software so you can get going straight away. It also doesn’t require drivers, making it extremely easy to get started with. There are no pads on this keyboard and only volume and power buttons, so it’s not the most feature-heavy midi controller out there. However, it’s simple to use and has a modest look to it, which will fit well in any home studio. It’s most suited to those who want to play and record at home, and who are new to DAW software. 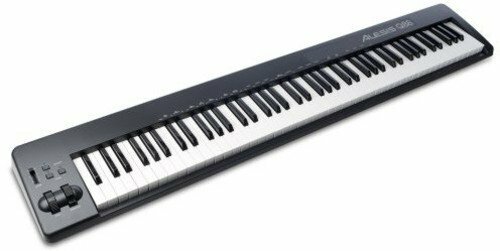 The Alesis Q88 will be less suited to pianists, due to its lack of weighted keys and additional features. Velocity-sensitive keys, so you can deliver an expressive performance. Pitch and modulation wheels, as well as octave up and down controls to give you excellent controllability. Sustain and volume pedal inputs. It’s DC-powered, rather than bus-powered. The StudioLogic SL88 also has a simplistic look to it. It has assignable joysticks and a small screen which is navigated through via a wheel dial. There are also three assignable function buttons. You get hammer-action keys with aftertouch so you can have full control over the expression of your playing. There are also 4 programmable zones so you can edit the sounds differently throughout the keyboard’s range. It also comes with 4 programmable pedal connectors and a rail system which can be used in combination with sheet music or laptop holder (not included). A sustain pedal is included. The StudioLogic SL88 will fit well in a recording studio, as it is robust, reliable and multi-functional. 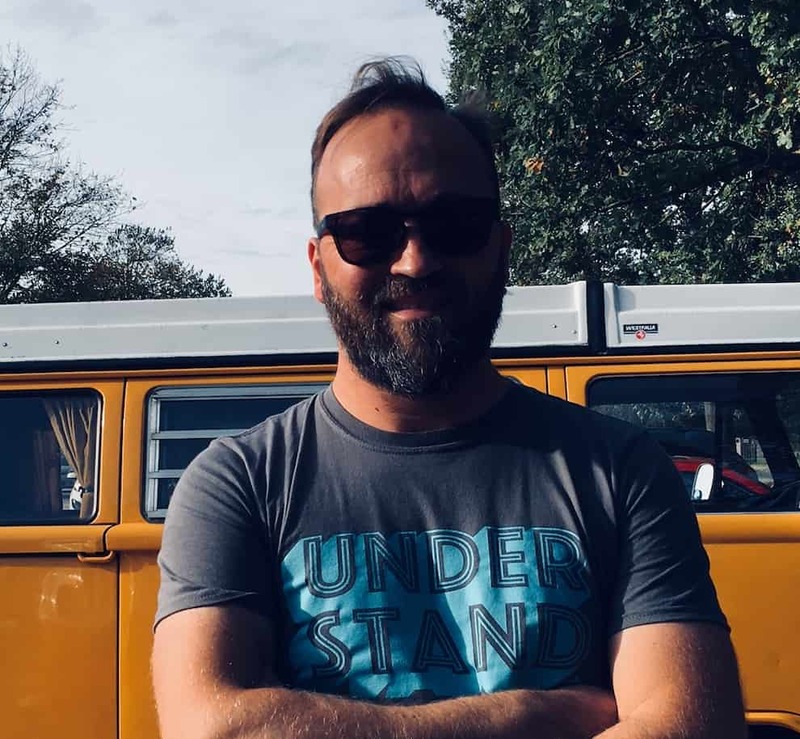 It will be less suited to musicians who want something to carry from gig to gig, as it’s pretty heavy and can take some time to learn how to control. Weighted keys with hammer-action, giving it the feel of a piano and there’s also aftertouch for additional control. It’s powered by an AC adapter, rather than bus powered. No pitch or modulation wheels; instead these can be controlled by joysticks. The M-Audio Hammer 88 has hammer-action keys which give it the feel of a real piano. There’s also a music sheet stand included, so it’s excellent right away for those who perform classical or session piano performances. There are pitch shift and modulation wheels to enable extra expression and creativity, though there is no aftertouch function on this keyboard. It’s compatible with iOS via the Apple iPad Camera Connection Kit, and comes with Ableton Live Lite so you can get playing right away. There are no pads or zones on this keyboard, so it might not suit those who like to get super techy. However, this is perfectly suited to pianists who perform in a variety of venues or styles, and it includes some virtual instrument settings which sound like real pianos. It has the option of being powered via USB or an external power supply. Hammer-action, weighted keys give it the feel of a real piano. There’s a music sheet stand included, which makes it great for piano-style performances or for playing by lead sheets. Pitch shift and modulation wheels enable expressive performances. No zones, so you’re limited to using one sound setup at a time. There’s no display, so it’s less easy to control than other controllers. Although the keys are hammer-action, there’s no aftertouch. The Nektar Impact LX88 is an advanced machine with an abundance of functions. As well as the 88 velocity-sensitive keys, you get 8 pads, 9 assignable buttons and 9 faders. There are pitch bend and modulation wheels and 2 zones. It’s compatible with most DAWs including Cubase, Logic, Reason and more. 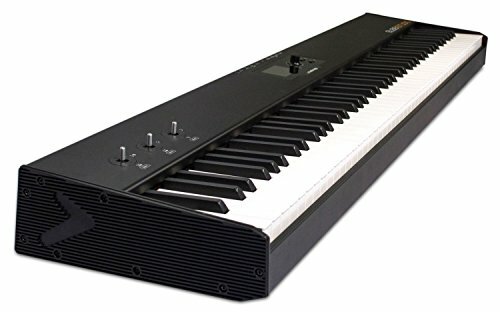 It has a sustain pedal as well as a USB and midi output and has an option DC connection. Unfortunately, the keys are only semi-weighted and there is no aftertouch. It will suit digital composers who make electronic music and want a high amount of audio options at their fingertips. It will be less suited to pianists, due to the lack of feeling. Full-sized keys and velocity-sensitive, with editable velocity curves. Automaps to most popular DAW software including Cubase and Ableton, with assignable knobs, faders, pads, footswitch jacks, and transport controls. It’s very light at only 18lbs. Semi-weighted keys, so it won’t feel like you’re playing the piano. The Icon ICOK iKeyboard8X is a slim, lightweight controller with robust metal casing. It features pitch and modulation wheels, and the keys are velocity-sensitive (they aren’t hammer-action, and there’s no aftertouch). But the portability of this keyboard makes up for that. It comes with 18 assignable LED buttons which are easy to use and see, and the iKeyboard8X comes with iMap software to make it easy to map the device to various DAWs. It has a sustain pedal connection and a midi and USB port. The iKeyboard8X is also bus-powered. This is perfect for the musician who travels with their gear and doesn’t want to sacrifice their music-making options for the sake of space and weight. It will be less suited to those who want something with advanced features, as it’s quite modest with lack of faders, pads or zones. It’s extremely portable and lightweight. Pitch and modulation wheels, which give you controllability and creative options. No faders, pads or zone options. The Native Instruments Komplete Kontrol S88 is an advanced controller with fully weighted, hammer-action keys and several built-in sound controls. It also has aftertouch, so you can keep on controlling your signal after you’ve pushed the button. The built-in sound controls are buttons which adjust EQ, attack and release time and tone settings. This makes it one of the most hands-on devices, as you don’t need to click in your software to make adjustments. It’s can also automap to several DAWs, including KOMPLETE, Ableton Live and Cubase, which is great for those who want to plug in, get going and get creative. The Native Instruments Komplete Kontrol S88 is suited to producers who use a variety of sequencing software. Despite having fully weighted keys, it will be less suited to those looking for an authentic piano-like playing experience, due to its additional features and digital focus. Fully weighted, hammer-action keys with aftertouch give you full control over your sound. Automaps to several DAWs including KOMPLETE, Ableton Live, and Cubase. Comes with compatible software bundles and instrument packages. KOMPLETE software isn’t compatible with external instruments. The Kawai VPC1 offers a very piano-like playing experience. The full-size, hammer-action keys feel like ivory, and the included three pedals means that you can pretend you’re on a grand piano. As well as this, it has midi input and outputs, as well as USB, so you can connect it to other compatible synths if you need a vintage sound. It comes with the VPC editing software, which allows you to edit the touch curve and velocity of individual keys, giving you a superior level of control, and you can also choose whether you power the Kawai VPC1 by USB or AC. There’s an included music rest, and this piano has the aesthetic of a grand piano. Without a doubt, this is the most suited to those who love the look, feel and sound of a real piano. It will be less suited to digital producers, who want extra knobs, wheels, and faders that this traditional-looking instrument doesn’t have. Its weight also makes it prohibitive for travel. Hammer-action weighted, and full-size keys that feel like ivory, plus three pedals make this very akin to a piano playing experience. Comes with a 5-pin and USB output, plus a 5-pin input so that you can connect additional controllers. Comes with the VPC editor so that you can edit the touch curve and velocity of individual keys. It’s pretty heavy – at 65lbs it’s not the most portable of instruments. No DAW controls at all, so it’s mainly aimed at pianists rather than digital producers. 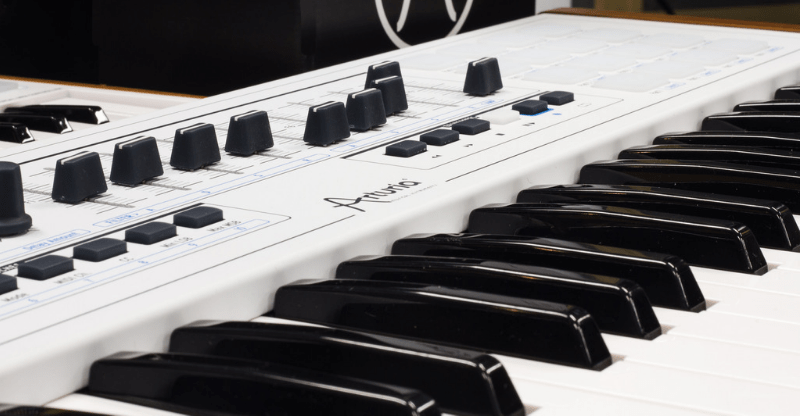 The Arturia KeyLab 88 has hammer-action, velocity-sensitive keys with aftertouch. 16 pads, 9 faders, 12 rotary encoders and 10 assignable buttons make this a beast. There are pitch and modulation wheels that give you creative and expressive playing, plus an integrated sheet music / iPad stand so that you can perform with ease. 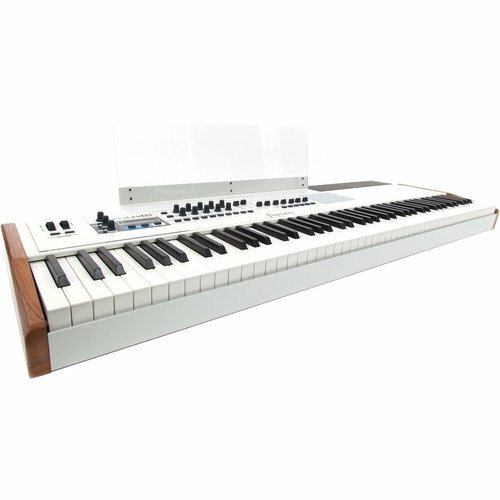 It comes with Analog Lab 2 software and Arturia Piano V so you can get started right away, and there are midi, sustain pedal and USB connections. There’s also an adaptor input, as this keyboard is not bus-powered. It has an additional shelf for a laptop or other instruments, and it has wooden sides which make it look at home in any studio. It might be less suited to regular gigging, as it’s quite heavy and might be hard to find an appropriate case for. Velocity-sensitive, hammer-action keys with aftertouch. 9 faders, 12 rotary knobs, and 16 pads give you loads of creative options and control. There are connectors for sustain and expression pedals as well as an AUX foot switch connector. It’s powered by an adapter, rather than via USB. The Roland A-88 is another high-end option. It is extremely special as the only one in the list which has progressive hammer-action keys. They also feel like ivory, and there are connections for a sustain pedal and two assignable foot pedals. You can really make this play like a grand piano. It has split keyboard options, so you can get creative with your sounds and it is lightweight and easy to transport or store away. There are assignable knobs and switches, as well as octave and transpose buttons to shift the range of your instrument. It comes with an included sustain pedal and an AC adapter, although the keyboard can be bus-powered if you prefer. It’s straightforward to plug in and play, making it perfect for those who want to play the piano at home but perhaps don’t have the space for a real one that would achieve their desired sound. It might be less suited to those who want to gig, as it doesn’t come in particularly sturdy casing. It has progressive hammer-action weighted keys with an ivory-feel, so it’s very piano-like. Connections for a sustain pedal and two assignable foot pedals. It’s lightweight and easy to transport. It uses a lever rather than a wheel for modulation. It requires the installation of drivers to work. Powered via an adapter, rather than bus-powered. If you’re looking for something that plays, sounds and even looks like a piano, the Kawai VPC1 offers the aesthetic, sound and feel that you’re looking for. 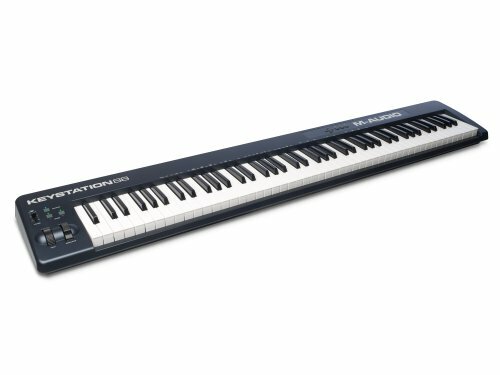 If you want to take that authenticity of feel even further, the Roland A-88 takes it there, with the addition of graded hammer-action keys. Digital producers might prefer something with the addition of pads and extra buttons, so you’ll be better off looking at the Arturia KeyLab 88 or Nektar Impact LX88. Those who want something that’s suited to the studio or home studio will do well with the Komplete Kontrol S88, Alesis Q88 or StudioLogic SL88. Out of these, the StudioLogic SL88 is the most piano-like. If you’re looking for something slim and travel-friendly, the Icon ICOK iKeyboard8X is light and benefits from the sturdy casing. If you want something that you can use in a wide variety of styles and surroundings, the M-Audio Hammer 88 is your best bet. 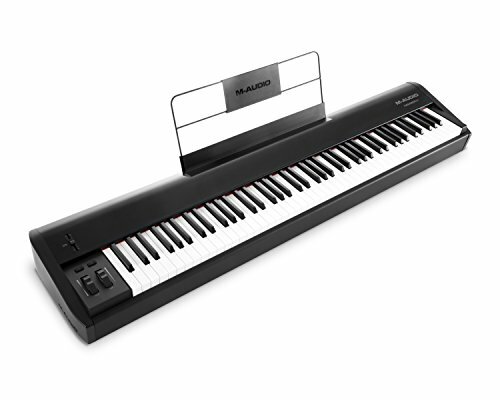 The M-Audio Keystation 88 is the most suited to beginners, due to its ease of use and the relatively low price. Whichever one of these you think is best for you, we hope that this has been helpful.